His Royal Highness the Duke of York. This Day Thomas Butler, de Moore Parke, Chevalier, Son and Heir Apparent to James Duke of Ormond, Steward of His Majesty's Houshold, was introducted, in his Robes, between the Lord Arlington and the Lord Crofts, being likewise in their Robes; the Lord Great Chamberlain of England, and St. George Deputy to Garter King at Arms going before. 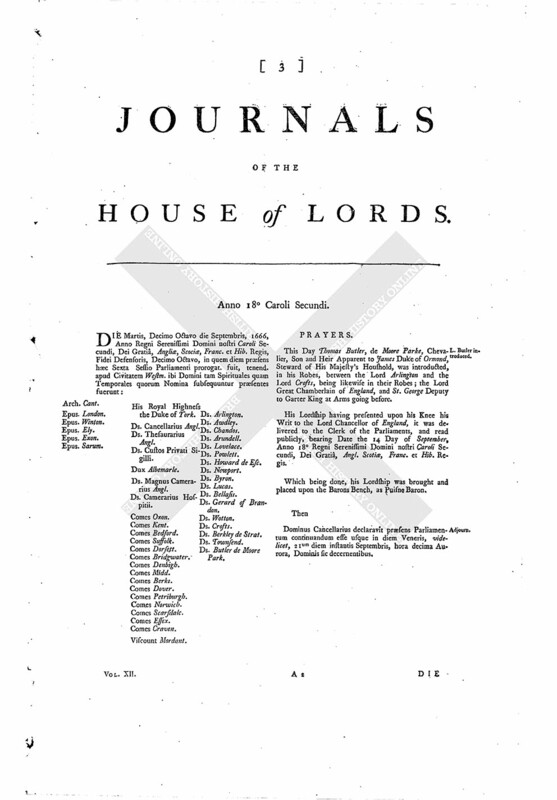 His Lordship having presented upon his Knee his Writ to the Lord Chancellor of England, it was delivered to the Clerk of the Parliaments, and read publicly, bearing Date the 14 Day of September, Anno 18° Regni Serenissimi Domini nostri Caroli Secundi, Dei Gratiâ, Angl. Scotiæ, Franc. et Hib. Regis. Which being done, his Lordship was brought and placed upon the Barons Bench, as Puisne Baron. Dominus Cancellarius declaravit præsens Parliamentum continuandum esse usque in diem Veneris, videlicet, 21um diem instantis Septembris, hora decima Aurora, Dominis sic decernentibus.